Click on a zone on the map to see openings in a specific area or scroll down to see a list of job descriptions and availability. Personnel are a key component to the success of the eradication process. Qualified applicants are needed in every stage of the program. Every position is vital to the continuing effort of eradication. The Foundation's headquarters office is in Abilene, providing administrative and technological support to all zones. The zone and district offices support the employees on the front lines of eradication and provide information and other services to the cotton producers of Texas. Zone Manager -- responsible for the management, direction and oversight of all program activities within a zone. 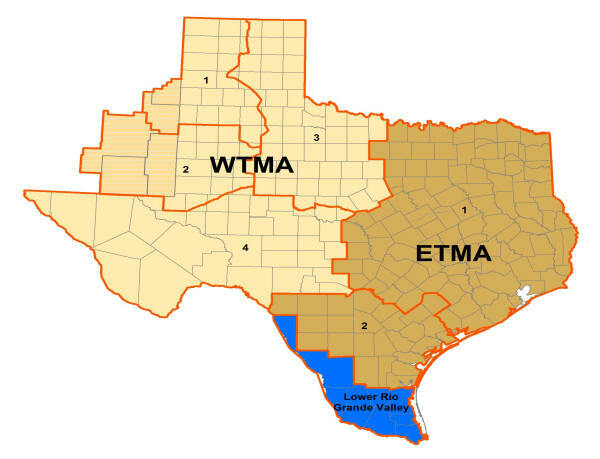 Interacts with producers, aerial applicators, the Texas Agricultural Extension Service, the Texas Department of Agriculture, other relevant state and federal agencies and the general public. Click for complete job description. Assistant Zone Manager -- assists the zone manager in providing direction and support to zone employees. Coordinates and implements training programs for zone employees. Zone Safety/Vehicle Officer -- provides guidelines and direction about the safe use of vehicles and equipment used in the zone. Primary contact for safety and vehicle management in the zone. Zone Environmental Monitoring Specialist -- ensures that the policies and regulations governing the application of pesticides near environmentally sensitive sites are followed. Responsible for quality control on the placement and proper use of traps. Maintains insecticide application database for the zone. Serves as the primary contact for cotton producers and the general public who are located near environmentally sensitive sites. Zone Secretary -- Organizes the administrative functions of a zone. Duties include the preparation of letters, reports, memoranda and technical documents. District Supervisor I or II -- oversees operations for a district within a zone. Ensure proper administration of the program, makes personnel decisions, and works with producers, landowners and the general public. Field Unit Supervisor/Field Unit Manager -- supervises and directs program operations for a work unit within a district. Trains seasonal employees, assigns and directs their daily work activities and performs quality control on their work. Contacts producers about program activities on their fields. Environmental Monitoring Specialist -- monitors pesticide applications near environmentally sensitive sites. Performs or verifies quality control on trap placement and inspection and trapping data. Field Clerk I or II-- performs administrative tasks at the district office, including purchasing, clerical duties, answering phones and greeting the public. Assists with personnel-related tasks such as providing assistance in filling out job applications and personnel forms and contacting Human Resources for answers to personnel issues. Mechanic I or II-- repairs and maintains equipment such as sprayers, pumps, small motors and other equipment used for insecticide applications to cotton fields. May perform minor or emergency repairs to Foundation vehicles. PBW District Supervisor & Environmental Monitoring Specialist--oversees pink bollworm operations within a zone. Ensure proper administration of the program by working with the Zone Manager and State Environmental Monitoring Specialists, makes personnel decisions, and works with producers, landowners and the general public. Pink Bollworm Office Coordinator--performs administrative tasks at the district office, including purchasing, clerical duties, answering phones and greeting the public. Assists management in supporting the operation of the eradication program. Assistant Field Unit Supervisor -- Assists the field unit supervisor in assigning and directing the work of other seasonal employees. Aids in coordinating trapping and spraying activities, training and quality control. Click for complete job description. Field Technician -- This position combines the positions of trapper, ground observer and airport recorder. Click for complete job description. Job opportunities with the Foundation are posted at Headquarters, all Foundation zone and district offices, and the Foundation Web site. Applications may be obtained at any Foundation office or downloaded from the Web site. Resumes may be submitted as a request for consideration but not in lieu of a completed application. Applications are reviewed to determine the applicant's qualifications for a position. Qualified applicants may be contacted for an interview. Candidates will be notified by mail that the position has been filled. All interested current TBWEF employees must submit a letter of consideration accompanied with a resume and a current TBWEF application stating their qualifications for the position.